When is the best time to do the Wellington Wine Walk? Due to its Mediterranean climate, Cape Town is a pleasure to visit throughout the year. Bear in mind that the days can be very hot for walking between December and March, therefore the Wellington Wine Walk season starts towards the end of March and ends at the end of November. How far is Wellington from Cape Town? We are about 72 km (an hour's drive) from Cape Town along good tarred roads. When do I get my detailed itinerary? A detailed itinerary will be sent to you when you have paid the balance of your payment about a month before your walk. You can contact us with your query by selecting contact us, and clicking on the e-mail link to send us an e-mail. What's included in my Wellington Wine Walk package? 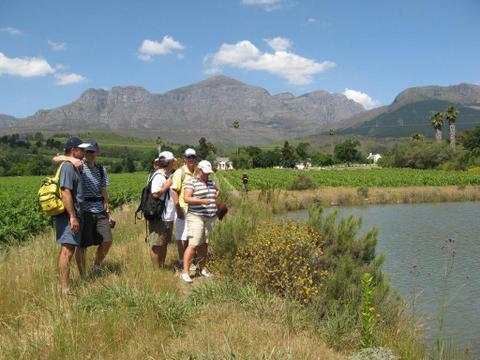 * Accommodation at selected guest houses in the Wellington and Paarl valleys– all including dinner, bed and breakfast. What's not included in my Wellington Wine Walk package? You should be moderately fit to do this walk. There is no strenuous climbing but we do have a few sharp up and downhill sections. A stick can be very useful. You need to carry your own day-pack with your personal items as well as your water. Is there someone who can help with First Aid should I require it? Our guides are competent to perform basic first aid and will carry the necessary kit. In the case of a medical emergency which warrants immediate medical intervention, occurring while on the walk, an ambulance and qualified medical persons will be brought to the guest for further attention. Please note that this will be to the guests personal account. Please note: If you have any allergies (e.g. bees, pollen etc. ), please remember to bring your anti-allergy medication. You will be responsible for informing the guide of any medical condition you may have and for carrying your own prescribed medication. Can I get a lift to the next guest house with the luggage transport vehicle? Should anyone require individual transport during the 3 days of the walk, due to medical condition (or other), we would need to call on an external taxi service to assist with this and this would be for your own account. We suggest that you take out personal insurance to cover medical expenses, personal accident, loss or damage to personal property, loss of money, loss of or damage to luggage, etc. We do not take responsibility for these items.